By incorporating top of the line materials like GORE-TEX and Vibram and an all-leather upper with a weight-saving platform, we made our tough, versatile work boot feel like the kind of boot you want to put on at the end of a long day. We borrowed the lightweight, agile Trailguard platform from our hiking boots to engineer this work boot to be nimble and tough from the ground up. This new last is designed to cup your heel for a secure fit while offering a little more room in the toe box to accommodate feet that are carrying heavy loads or changing directions quickly. It also comes with a dual density EVA midsole for extra shock absorption and comfort. The oil and slip resistant outsole have a low profile 90 degree heel making it versatile enough for indoor and outdoor work. 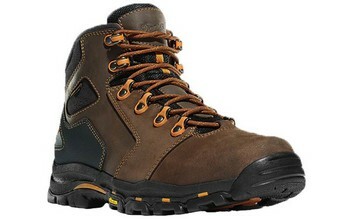 but for really tough jobs it has an abrasion-resistant heel cap and a waterproof, breathable GORE-TEX� liner. Consider the type of socks you�ll be wearing with your boot. For thicker socks, you may want to select a half size larger than you normally wear. When you do receive your boots, we recommend first wearing them indoors for a few hours to ensure they�re the right fit.